Incisors (from Latin incidere, "to cut") are the front teeth present in most heterodont mammals. They are located in the premaxilla above and on the mandible below. Humans have a total of eight (two on each side, top and bottom). Opossums have 18, whereas armadillos have none. Children with a full set of deciduous teeth (primary teeth) also have eight incisors, named the same way as in permanent teeth. Young children may have from zero to eight incisors depending on the stage of their tooth eruption and tooth development. 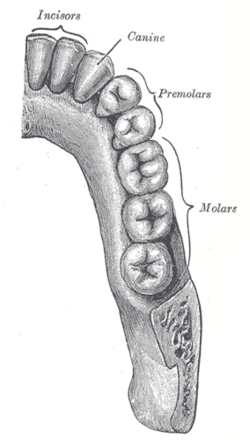 Typically, the mandibular central incisors erupt first, followed by the maxillary central incisors, the mandibular lateral incisors and finally the maxillary laterals. The rest of the primary dentition erupts after the incisors.